That's a surprise, thanks for sharing. As for Sinestro, he was in cases with a GL Hal with construct motorbike, and Atrocitus. They have all come and gone and were missed by almost everyone before Fisher Price allegedly pulled them from production. Finding them now is pretty much relegated to eBay and Flea markets, and even those sightings are less frequent than rare. Atrocitus, Sinestro, Aquaman and Motocross Hal are mine! I can't believe it. Did you win the eBay auction? I saw that but it went out of my price range early on. I did indeed and thanks. Atrocitus and Dextar were kind of a white whale for me and Aquaman was the awesome kicker on top. Congrats, Kev. Quite the auction to win. I just saw it. Made me sad I missed it. Just need to hunt down that Robin. And then wait for an Atrocitus to pop up. I got Aquaman (via Amazon) delivered this morning, and my little ones really like him. Can't wait to find Robin. Wish the line had some women superheros. 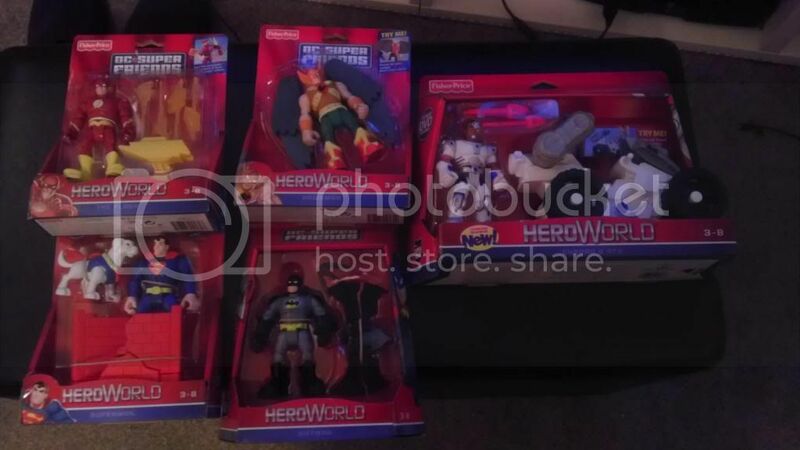 I was able to find the Batman with motor bike and the Hawkman figures at a KMart near me. Got The Flash figure and Aquaman figure with boat on Amazon at decent prices. Now I'll be on the hunt for the Robin figure. Thanks for the Amazon heads up. Now I'm down to needing the elusive "Atrocitus wave" and the upcoming Robin figure. thanks for the heads up just snagged aquaman off amazon.also picked up the imaginext joker and harley and the new bat attackcoptor .now just gotta land robin. Is this the dreaded Target online kiss of death ? Batman Brave and the Bold Faceless Hunter ? I know there was a Disney Cars product that was never produce that they also had listed. I bet Robin comes but Target never gets them lol. I mean one has to wonder where they get these pics ?? ?